The expression, “There’s nowhere quite like it,” is one of those overused phrases people say a lot. However, when folks are talking about historic downtown Eureka Springs, you can take them at their word. They are, in fact, being quite literal. Picture an eclectic combination of bistros, boutiques and bar-and-grills housed in amazing turn-of-the-century architecture. You’ll find shops, art galleries and more in structures built as long ago as the 1890s. The entire district itself is listed on the National Historic Register, and great care has been taken by the residents of this resort town to keep it well preserved. In fact, you won’t find a single stoplight. The healing springs of this picturesque mountain town in the Ozarks have attracted visitors for hundreds of years and helped earn its reputation as a destination for relaxation. Today, it remains one of the most unique cities in the country. Here you can experience award-winning cuisine, a massage and live music – all within a couple of blocks. For something a bit more eclectic, you can also get a psychic reading, visit a tattoo shop or take a ghost tour all in the same day. You do you in Eureka. A trip like this deserves equally amazing accommodations. A short trolley ride away is the Best Western Inn of the Ozarks. Not your average Best Western, The Inn of the Ozarks is a locally owned and operated lodging experience with a collection of amenities unavailable anywhere else in town. This peaceful retreat is surrounded by 30 wooded acres and features a family game court, a lagoon-like poolside courtyard with a water feature and one of the best home-style cooking cafés in the entire state. Experience true Southern hospitality in the comfort of spacious rooms with plush-top beds and dream maker pillows. You’ll also enjoy close proximity to the downtown district and all of the exciting destinations in and around Eureka Springs. Really, there’s nowhere quite like it, and we really mean it. Eureka Springs is the cozy village in the Ozarks known for its relaxing spas and laid-back vibe. However, some are surprised to learn about the resort town’s opportunities for getting gnarly. The area is has many ways to fulfill your need for speed with fast-paced downhill trails and soaring ziplines. Many folks make the trip to Eureka Springs to chill, but others come for the thrill! The nearby Lake Leatherwood Gravity Trail project features seven downhill trails with a shuttle service available Thursday through Sunday. The difficulty of these trails ranges from beginner to expert, so always be sure to ride within your skill level. There are also single-track loops of various difficulties and scenic trails on paved roads for less-experienced riders. Speaking of scenery, one of the most exhilarating ways to experience the views of the Ozarks is by screaming through the forest at impressive heights. Ziplining tours give you the experience of flying at 300-plus feet off the ground. Hope you’re ready to fly high! When you’re choosing your place to stay, be sure to find a location close to these outdoor attractions. For, example the Best Western Inn of the Ozarks is conveniently located on Highway 62, giving you easy access to all of the outdoor activities mentioned here. Locally owned and operated, the Inn features an amazing poolside courtyard perfect for relaxing after a long day of outdoor adventure. Kids will enjoy the swimming pool with a waterfall feature while the adults may prefer to just lounge under the shade of a tree with book or a cool drink. If you’re looking for a location for excitement in the natural beauty of the Ozarks, remember Eureka Springs has a lot more to offer than just relaxing spas. But after a day of these outdoor activities, a massage may sound like a pretty good idea. Roaring down a two-lane highway winding through forests of hardwood trees, each hill you and your bike crest offers another view of some of the most pristine country in the Ozark Mountains. Every turn reveals a bluff in the distance more beautiful than the last. You’ll also see bikes of all models with riders giving the familiar “motorcycle wave.” That’s what riding to Eureka Springs is like, and you haven’t even gotten into town yet. 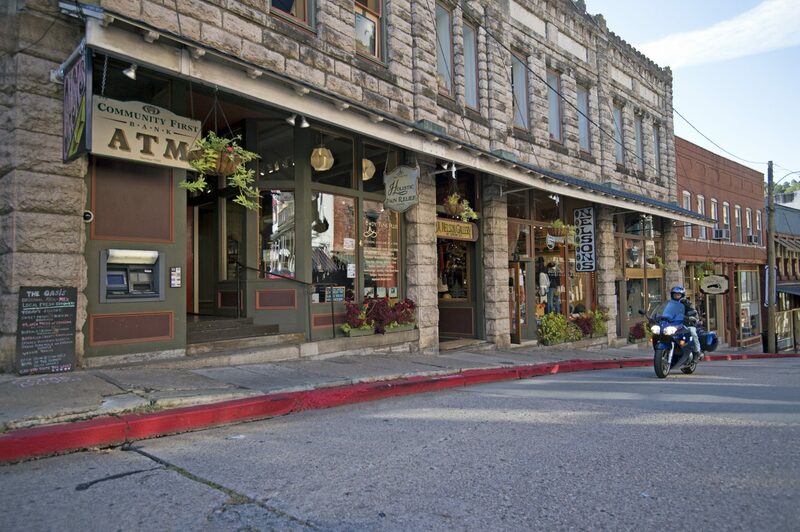 Eureka Springs wasn’t built with motorcycles in mind when it was incorporated over 130 years ago, but you’d be hard pressed to find a more motorcycle-friendly city anywhere in the US. There are quite a few establishments catering to motorcyclists specifically, but you’ll receive friendly treatment anywhere in town. Over the years, many motorcycle riders have mapped out rides of various distances. You can take a six-hour trek and make a day of it, or choose a ride anywhere between a half-day and one-hour. Each one offers its own unique perspective of the landscape with serpentine roads through historic bridges, national parks or small-town communities scattered across the Ozarks. You can easily access all of these rides as well as the must-see attractions in downtown from the Best Western Inn of the Ozarks. The Inn is located on Highway 62, the starting point to all of these road journeys. Guests can also rest easy knowing their bike is safe and parked nearby. Best Western Inn of the Ozarks offers secured, covered motorcycle parking. But availability is limited, so if you want to take advantage of this perk, make sure you call ahead. After a day of winding rides, it’s time to unwind and settle in for some well-deserved rest. The Best Western Inn of the Ozarks is locally owned and operated by folks who understand Southern Hospitality, making it the perfect lodging to get the most out of your motorcycling adventure. Selecting your accommodations for a getaway to Eureka Springs can be a bit overwhelming. You want proximity to all the attractions offered in this historic retreat of the Ozarks. However, it’s equally important to find quality lodging with a welcoming staff and amenities to make sure your group has a comfortable, memorable trip. Look no further than the Best Western Inn of the Ozarks, located on one of the many city transit trolley stops on Highway 62. Nestled in 30 wooded acres of natural beauty, the Inn offers tranquil views and peaceful solitude after a busy day of sight seeing and entertainment. Guests of the Inn are just a short trolley ride or walk to Eureka Springs’ Historic district. This location is also minutes away from another famous attraction, just two miles down the road from The Great Passion Play. Also easily accessible via the Eureka Springs Transit trolley route, this property includes the 66-foot “Christ of the Ozarks” statue, the largest of its kind in North America. If your group requires outdoor excitement, Best Western Inn of the Ozarks is just a short drive from outdoor adventure of every kind – hiking, biking, fishing, boating and so much more. This one-of-a-kind, locally owned property offers plenty attractions and leisure activities of its own. Although affiliated with Best Western, the Inn of the Ozarks is not a chain. The Inn is operated by Eureka Springs residents who know the area and how to treat their guests with a heaping helping of Southern hospitality. Kids and grown-ups alike will enjoy the game court and the outdoor swimming pool. The poolside courtyard includes an impressive waterfall feature creating the perfect setting for lounging in the shade for maximum relaxation. Whatever you have planned for your Eureka Springs getaway, you’re guaranteed an enjoyable stay at Best Western Inn of the Ozarks.